Released in September 2016, the hotly anticipated Minecraft for Education is a collaborative and versatile platform that can be used by educators to encourage 21st century skills. For teachers who have never used Minecraft before, getting used to the system can be a steep learning curve, but there is a handy training section to get you started with the controls and how to craft. The beauty of Minecraft is that there is no real right or wrong way to play! It’s an open world game, meaning the teacher can create the goals that the students need to reach. The creative and building aspects of Minecraft enable players to construct buildings from blocks. Other activities in the game include exploration, resource gathering, and crafting. So, what makes Minecraft for Education different to the original Minecraft? 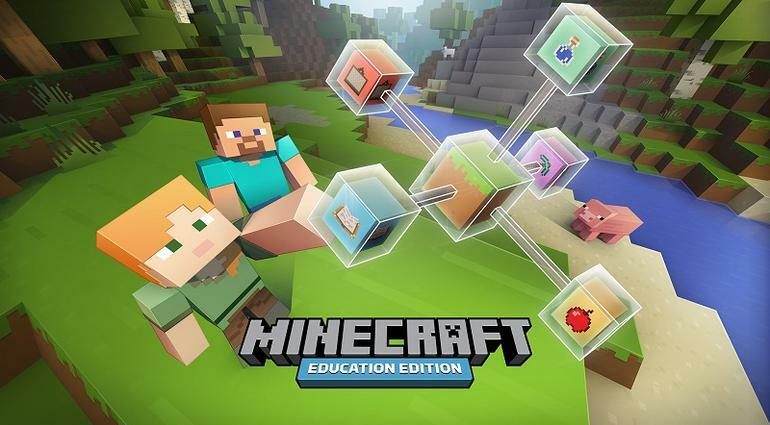 Developed specifically for educational use, Minecraft : Education Edition meets the specific needs of learners and educators. Educators have told us that one of the greatest benefits of Minecraft: Education Edition is the ability for students to collaborate together to build projects and solve problems. An entire classroom of up to 30 students can play in a world together to build projects and solve problems, or students can work together in pairs or groups, simply by joining their classmates’ world. An educator can create an NPC (Non-Player Character) to act as a guide for students in the game, giving instruction, providing more information, and also allowing educators to insert an active web link to additional references. An important aspect of teaching with Minecraft is being able to collect evidence of learning in the game, and being able to track student progression. The camera and portfolio features allow students to take screenshots of their work and document the development of their projects. Creators can use chalkboards to communicate learning goals, provide additional information, and give explicit instructions within the game. Chalkboards come in three different sizes – Slate (1×1), Poster (2×1), and Board (2×3). Individual student and teacher logins with Office 365 Education accounts, ensure data privacy and security while playing Minecraft: Education Edition. For educators or students new to Minecraft a tutorial world is available that will guide players on in-game navigation, crafting, and placing or breaking blocks. Designed to be a versatile and open learning platform, Minecraft can be used in the classroom to teach and develop a whole host of key skills, including collaboration, problem solving, communication, digital citizenship, and much more. There is also a number of built-in lesson plans available, catering to a variety of subjects and age groups. From investigating land-use conflict, through to embarking on a long journey to discover the alphabet, there is a wide range of pre-planned lessons on offer. The Code Builder for Minecraft: Education Edition allows educators and students to explore, create, and play in a Minecraft world using code. There are also a full set of Intro to Computer Science materials and lesson plans to go alongside it. For science teachers, the Chemistry Update for Minecraft: Education Edition will allow students to discover the building blocks of matter, combine elements into useful compounds, and conduct experiments. And to optimise engagement, the game is also regularly updated with new updates. The latest updates include under water worlds, marine creatures and a further 17 standards-aligned lessons that have been created to engage students across a broad range of subject areas. Helpfully, there is already a comprehensive teaching resource section on the site, where you can access training resources, find lessons, find worlds, and much more. There is also plenty of support available, including FAQs, a knowledge base, and more. Currently, Minecraft: Education Edition costs 5 US dollars per user, per year (or the local currency equivalent). We can help you to refresh the technology at your school with leases for Laptops starting at £8.75 +VATper month orApple Leasing with iPad Mini leasing starting at £5.90 +VAT per month. We also offer Learning Labs from £375 +VAT per month, this consists of 30 iPad Air’s, rugged cases, installation a trolley and much more! All of our HardSoft leases come with Warranty, technical support and for iPads- rugged cases and accidental damage cover.